As their teacher, I want to see my high school students connecting, collaborating, writing, and revising. And that needs to start on day one. So instead of starting with the syllabus, we start by writing. I have students pull out a sheet of paper and ask them to describe who they are as writers and come up with a metaphor for who they are as writers. Over the course of our first day, students are writing, discussing metaphors, and then ultimately creating simple web pages that showcase an imageof their metaphor and a writing piece that explains its significance. And it is here where the tone of our class is set. Students are expected to write every day. Students are expected to collaborate. Students are expected to think carefully and critically. But I don’t have to stand in front of them and tell them that. They learn this by doing it. Starting with day one. Throughout our semester, I'll move away from using my traditional PowerPoint format for presenting writing craft lessons and instead create interactive videos for each concept with the idea that students can move through lessons at their own pace while taking notes on the concepts and work through practice activities. Because students can rewatch the videos as many times as they want and can learn at their own pace, I should have more time IN class to practice writing. I can use class time to draft, conference, and revise with students. 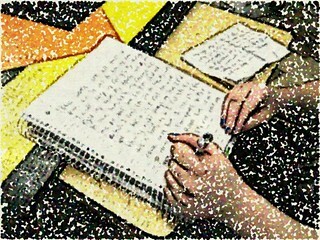 Writing then becomes a community activity, something we all do together in the classroom. I am building a community of writers. And it all started on day one by having them write. Couple of questions - what do you do about students who are not there on the first day? (change in schedule, etc.) And what do you do about students who do not have access to the video you created? Great questions! For students not there on the first day, they will always have the syllabus of the video to watch when they do arrive in my class. The trickier part is how to make up the experience of the writing assignment and web page creation that we do together in class on the first day. However, this is really no different than when a student misses any other day in that the students can make up the missed work by coming before or after school to work together on the missed work. I also created a tutorial video and a handout for our first assignment, so that even if the student can't meet outside of class to make up the work, detailed directions can be found on my class website. This is especially important as our first writing assignment/ web page becomes the place we house our online writing portfolio later on in the course. And how I address the issue of access: for students that do not have smart phones or reliable access to the internet at home, students are able to come in and use the laptops in my classroom either before or after school. They also have access to the internet through our school library. Many times students also have the opportunity to watch videos in class during our work time. But honestly, I have few problems with students who do not have access to the videos. Instead, I do have some issues with students who do have access but do not complete their homework. However, this is really no different than if I had assigned any other type of homework. So whether I have a student who elects not to watch a video or elects not to complete written homework, the way I work with those students to catch up is nearly the same. The big difference is that if a student misses watching a video, all I have to do is show the student where to find it versus if that student is missing a more traditional written homework (which we now do in class), I need to not only get that assignment to the student but also make sure to explain the steps. Flipping to video simplifies some of that make up process and also makes it easy to keep students and parents informed about what us happening in our class.